South Florida is a mecca for beautiful tropical weddings ranging from DIY to ultra luxury. Couples throughout Miami, Fort Lauderdale and Palm Beach as well as brides and grooms around the world choose Couture Bridal Photography for the best Wedding Photography in South Florida. Couture Bridal Photography is known internationally as the top Wedding Photography studio based in Fort Lauderdale providing the most spectacular Wedding photography for couples throughout Miami, Fort Lauderdale, Palm Beach, The Florida Keys and Puerto Rico. Couture Bridal Photography is South Florida's only boutique luxury Wedding Photography studio offering the most artistic documentary Wedding photography with a fashion forward, glamour and editorial flair. Couples choose Couture Bridal Photography over all others when planning their weddings in Miami, Fort Lauderdale and Palm Beach. Couture Bridal Photography was founded by Alfredo Valentine, an award winning published Wedding photographer with over 20 years of photography experience and training. Alfredo's unique and distinct approach to wedding photography throughout Miami, Fort Lauderdale and Palm Beach has made Alfredo and his Couture Bridal Photography team of assistant and lead photographers the most in-demand wedding photography studio in the Southeast. Alfredo Valentine, listed on FearlessPhotographers.com is among the worlds best wedding photographer for providing and innovating the wedding photography industry with a style best described as elegant, romantic and timeless. Alfredo's charm and easy going personality along with a fun creative attitude is among some of the qualities brides worldwide seek when searching for and book a wedding photography professional. Brides and grooms in Miami, Fort Lauderdale and Palm Beach preferred booking a wedding photographer that can tell a robust wedding day story with powerful heirloom images that are artistic and creative. Alfredo Valentine along with lead photographer Giovanni Gutierrez provide the style of Wedding Photography couples love along with a unique and creative perspective most South Florida Wedding Photographers cannot grasp. The common problem with most south Florida Wedding Photography companies like Michelle Lawson Wedding Photography, Traci Burke, Adept Wedding Photography, sentimento Wedding Photography, and Flavio & Rosina Studios is they are only picture takers with expensive cameras. They don't spend their time creating a relationship with their brides and grooms or spend the wedding day anticipating moments or setting various scenes for moments to take place. These among many more wedding photographers in South Florida are in the business of taking pictures not creating lasting artistic heirloom art pieces that tell a story individually or as part of a wedding photography collection. Another factor that has lead to the popularity of Couture Bridal Photography is our unique approach to lighting and exposing images correctly and intentionally with flash, strobes and video lighting to create mood, interest and draw the eye to key elements of an image. Our approach to wedding photography is the creation of intense emotion, mood and artistry with every shutter actuation. Among some of Couture Bridal Photography's many accomplishments is being the most preferred Wedding Photography studio at all of South Florida's many luxury Wedding venues in Miami, Fort Lauderdale, Palm Beach and worldwide. Unlike many wedding photography companies that spend their time trying to get on a preferred vendors list among other photographer, Venue, catering, and wedding planner directors mention us by name and provide our information to each couple they meet. This is a testament to the type of style, service and dedication to the utmost highest standards we set for all others to follow. 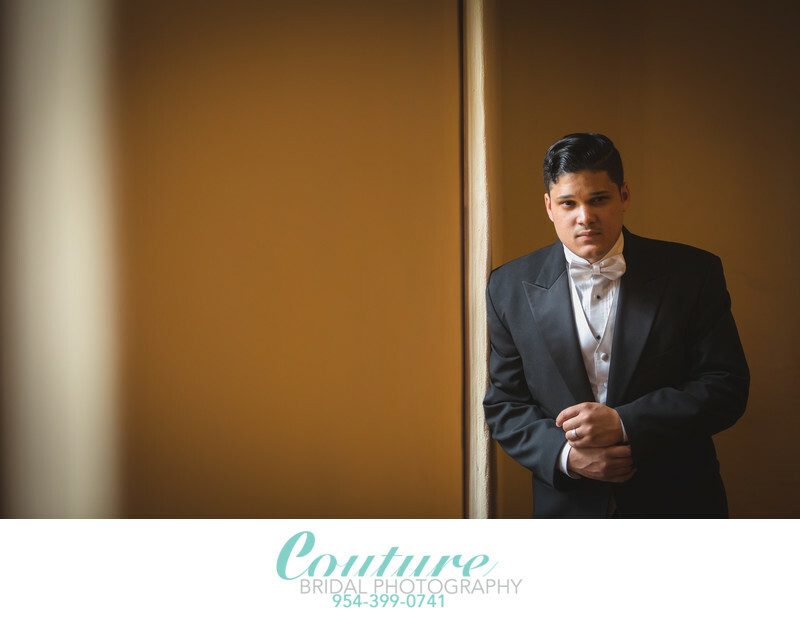 Couture Bridal Photography is also the most preferred Wedding Photography studio outside of Florida providing Wedding Photography around the world for Miami, Fort Lauderdale and Palm Beach couples. Keywords: Curtiss Mansion (6), Groom (30), Groom Portrait (6), Miami (36).